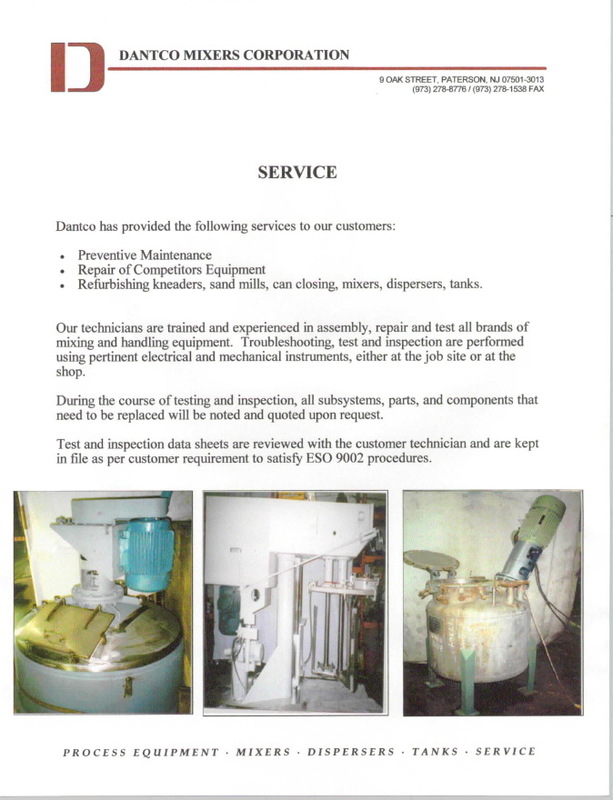 Dantco provides service for all brands of equipment as well as our own. Our technicians are trained and experienced in assembly, repair and test of all brands of mixing and handling equipment. Troubleshooting, test and inspection are performed using pertinent electrical and mechanical instruments, either at the job site or at the shop. During the course of testing and inspection, all subsystems, parts, and components that need to be replaced will be noted and quoted upon request. Test and inspection data sheets are reviewed with the customer technician and are kept in file as per customer requirements to satisfy ESO 9002 procedures. Dantco also provides welding, fabrication, erection, machining, piping, assembling and installation services. Copyright © 2003-2014 Dantco Mixers Corporation. All rights reserved.